[donotprint] I wish you could have joined me yesterday as I enjoyed eating this scrumptious blueberry shortcake (pictured above) all by myself in complete silence while savoring each bite. Rare moments like yesterday are moments I treasure. I wasn’t planning on making this but it just happened on a whim. I had just put my son down for his midday nap and baked my favorite cream scones with the intent on just spreading some homemade strawberry jam and butter. But this silly visual picture of a shortcake popped into my mind tempting me with possibility. 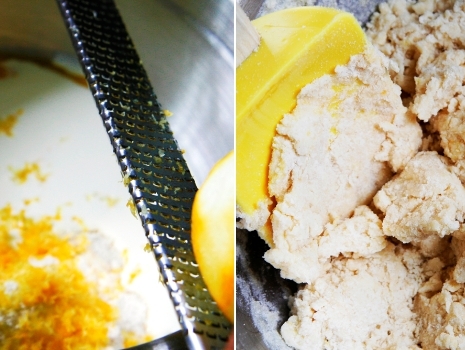 While the lemon zested scones were baking, I surrendered to my hearts desire. Why not just treat myself to something special… just for me. Before I had a chance to change my mind I quickly checked to see if I had everything I needed. 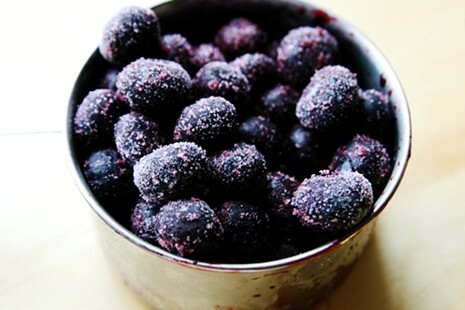 Frozen blueberries? Check. Heavy cream? Check. And because my yard is covered in wild blackberry bushes (which I can’t stand!) and fresh mint, I was even able to make my shortcake pretty. I won’t tell you in detail how much I enjoyed my blueberry shortcake other than to say, they were as satisfying as they are mouth-watering to look at. I also won’t tell you how ridiculously easy this dessert is to pull-together because I want you to believe I worked hard on this -really hard. And if by chance you ever do come visit me, I will make you a blueberry shortcake and answer the door with flour all over my face so you think I fussed over you. You will tell me I shouldn’t have and I will just smile and than *sigh* from apparent exhaustion. You will see tons of dirty dishes and bowls in my sink believing they are from preparing my dessert and offer to do my dishes. Don’t worry, I’ll let you wash them without telling you those dishes are piled up from 2 days of not doing dishes. Preheat oven to 400 degrees. 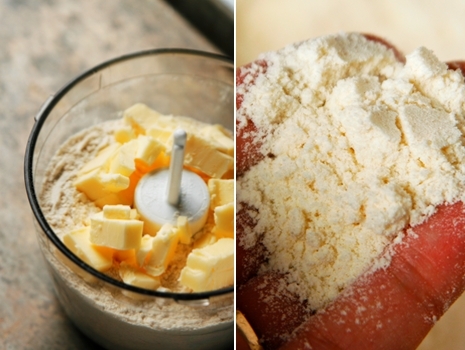 Place the flour, baking powder, sugar, salt, and butter in a food processor. Pulsate everything in 3-second intervals until everything resembles course meal. 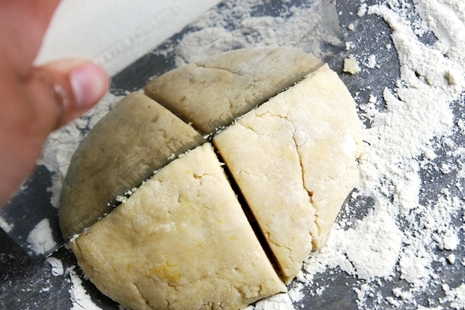 If doing this by hand, use 2 knives, a pastry blender or your fingers until the mixture resembles course meal. Transfer everything to a large bowl. 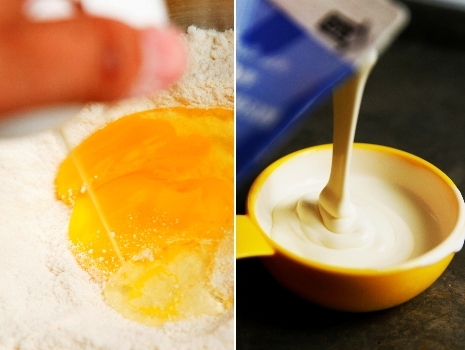 Stir in heavy cream, egg, vanilla, and lemon zest mixing the dough by hand until it forms into a uniformed and slightly moistened dough. On a floured surface, scoop out half the dough and form a ball. Flatten the dough until your disk is approx. 3/4″ in height. 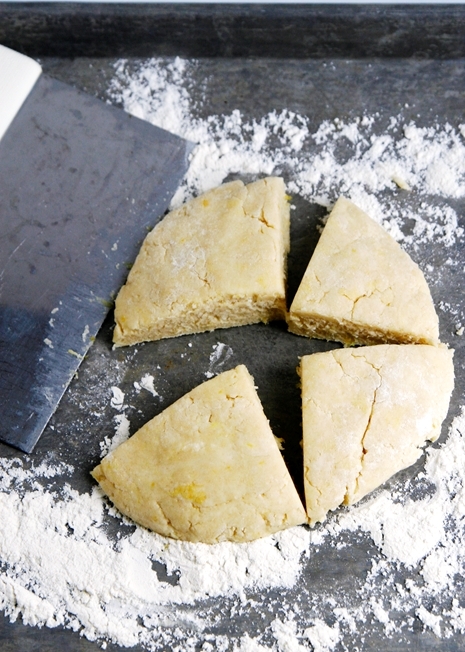 Press down the outside of the dough circle so the center is slightly taller. Cut each circle in quarters. You should have enough dough to make 8 shortcakes total. Bake for 15 minutes on a baking sheet lined with parchment paper or on an ungreased cookie sheet. 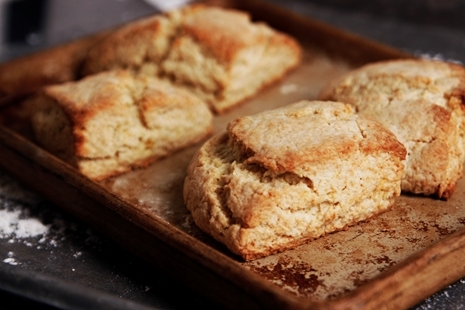 Remove shortcakes from baking sheet and cool on a wire rack. 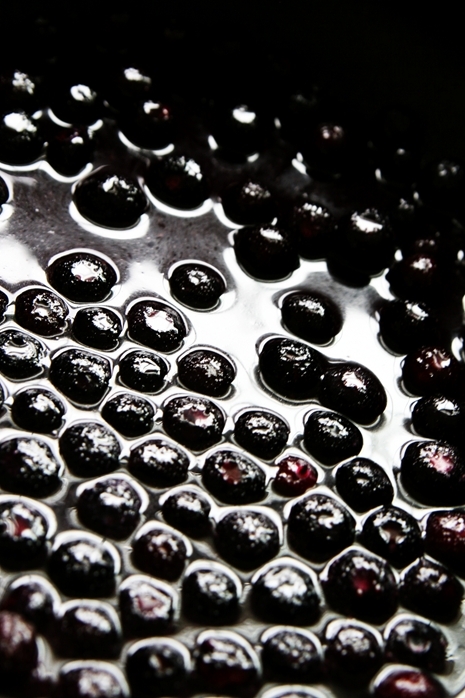 While shortcakes are cooking, prepare blueberry sauce and whipped cream. 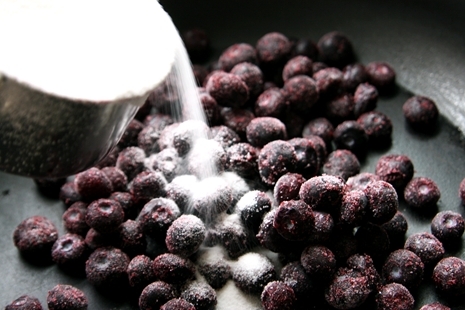 Cook blueberries, sugar, water, and lemon juice on medium-high heat for 5 minutes stirring occasionally. In a medium bowl, make a batch of sweetened whipped cream by whipping heavy cream, sugar, and vanilla with a hand mixer or Kitchenaid until your cream has formed peaks. Slice each shortcake in half horizontally. Place the bottom half on a plate. From there layer everything. Start by adding a couple tablespoons of blueberry sauce on top of the cut side of the biscuit. Next add a dollop of whipped cream and then place the other half of the biscuit on top. 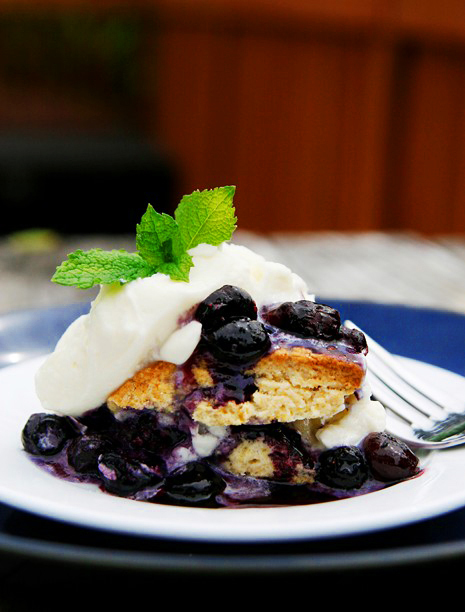 Finish the shortcake off with a couple more tablespoons of blueberry sauce and then a dollop of whipped cream. Optional garnish: Place a small mint sprig on top. Enjoy! Thank you so much for your lovely food posts, I adore them. 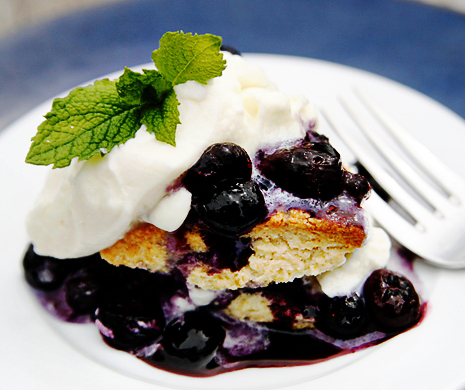 I would like to see more Shortcake recipes around, myself I like Blueberrys mmm. But my bf likes strawberry’s so we’ll have to find an in between. Looks awesome! I’m making this for my supper club tomorrow and I think everyone will love it! I was wondering if I can make the sauce and/or shortcakes ahead of time and reheat? Is is worth it? Thanks Alice! 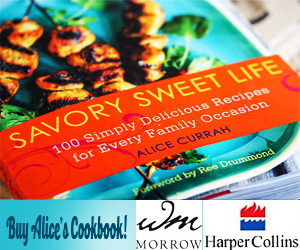 Wonderful recipes, and thank you for sharing! 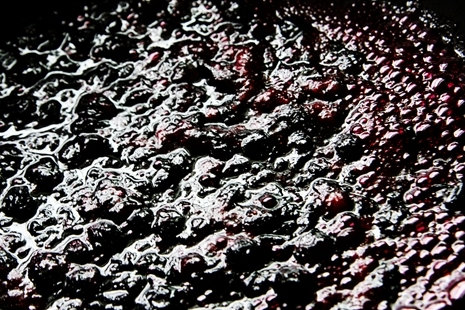 My wife mentioned she added 2 Tablespoons of corn starch mixed with 1 Tablespoon of water to thicken the blueberry sauce, as the sauce per the recipe was just a bit too watery for her liking. btw, I’m hosting a Magic Bullet giveaway on my blog and it’d be great if you could participate!